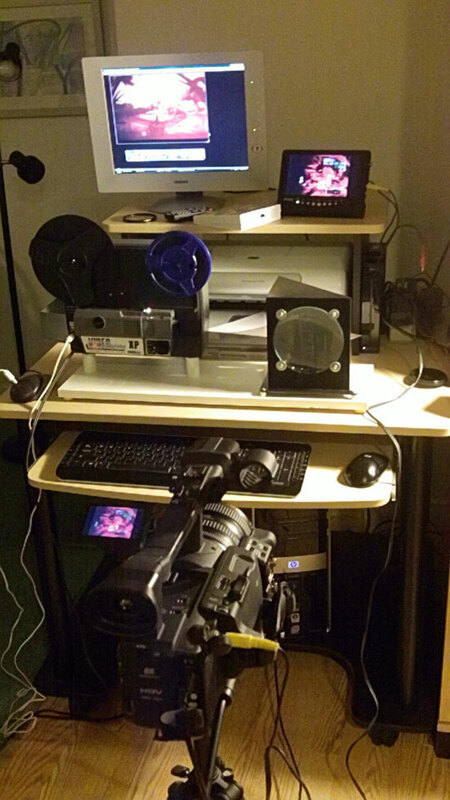 I have a Workprinter-HD that I has been using successfully for many years to capture 8mm films. 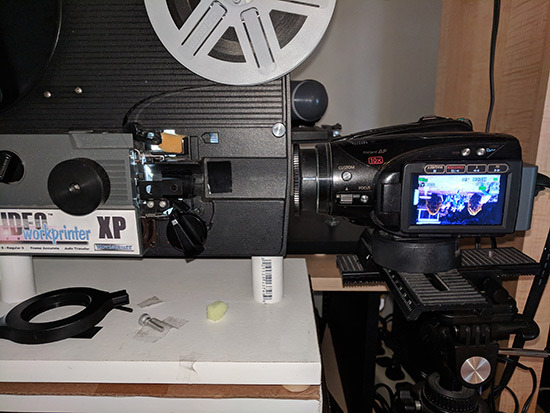 However, I continue to get a weird artifact when capturing Super 8mm films (and sometimes regular 8mm) that have very low lighting (indoor shots without proper light): there seems to be a lens reflection from my Canon XHA1 camcorder projecting on the capture film. This appears as a round "light" on the capture; increasing the lighting controls makes it more obvious. I've tried an anti-reflective lens on the camcorder with no impact. Has anyone had this problem and found an answer? I've tried changing the position of the camera as well as the Workprinter also with no effect. I can get the lens image to move toward the side, top and bottom, but lose the image when I move it too far. Hi Tom... Are you shooting off the mirror and condenser lens or directly off the gate? I remember when I was using the condenser lens at times getting reflections. It depends on the external light and any light-colored objects located behind the camera. I would place a large dark-colored cloth back-drop behind me and the camera if I detected a reflection. The condenser lens is glass so no way to get away with out it reflecting objects in front of it. This was my original setup. If you look closely you can see a reflection on the condenser lens. The reflective image will be more prominent in the capture depending on the overall lighting conditions. I no longer use the condenser lens, but shoot directly off the gate. I too originally used my XHA1 camcorder with the Workprinter, but it was too big to shoot off the gate. I now use the smaller Canon's like the HV40 or the newer HF20 or 200. This was my initial off-the-gate setup. It used a Raynox macro lens on my Canon HV40 camcorder to zoom in on the gate. Thanks for your input. I'm shooting off the mirror - haven't had the nerve to try your approach but maybe I will . . .
What type of 16mm Keystone lens are you using? I see some used Keystone's on eBay. Does the lens simply screw into the Workprinter in place of the current lens? I obviously already have the Blackmagic card and Cinepac Velocity HD software. If you use the 16mm lens, just remove the projector lens cover and the focus lever. The lens I use is the 2" f1.6 Sunray 107. It came on a Keystone K-160 16mm projector. The lens should fit nicely into the original lens holder. If it's too loose just wrap a little electrical tape around the threads to make it more stable. 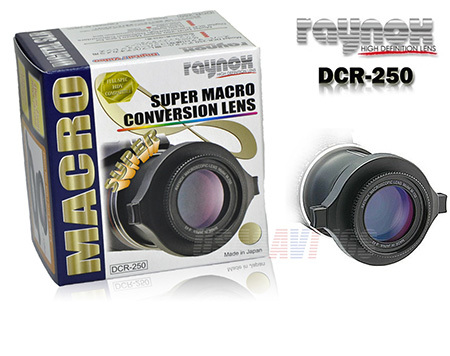 An alternative is to use no lens on the projector but attach a Raynox DCR-250 macro lens on the camera. Well I can only confirm Janice's setup that it will DEFINITELY WORK. Not frame-by-frame workflow,but optically identical. Any 16mm projection lens should work,as long as it fits into the lens barrel. Although I found that the standard 50mm lens will work best. You'll have to flip the video vertically in the post however (should be no problem in any NLEs). PS pls ignore the mess in the background. I love your camera platform Nantawat A new use for old VHS cartridges. I'm for anything that works Nice set up! I was too lazy to make a camcorder plateform. I bought an adjustable mini tripod and a macro slider. Then I raised the projector by mounting it on a ClosetMaid wooden shoe rack. It works for me. This is very helpful. Which process seems to work the best or are they pretty much the same. Janice - many of the K-160 projectors come with a Sunray F1.6 lens. Is there a specific reason you chose the F1.8 lens? The F1.6 lens apparently will capture a bit more light. Any insight you can offer on this? Also, if you were to choose a camera today would you still use the FH20 or, based on experience, would you choose something else? Since I have a second Workprinter-HD for backup it looks like I will be taking the conversion leap . . .
Hi Tom...Sorry...There was a typo in my previous post...it should have read f 1.6 for the Sunray lens - you can see that in the photo. I'll correct the post. As far as my camcorders...I'm sure any of the newer model Canon's that have manual adjustments should work fine. I've had all my Canon's for a long time and they all work in my setup so haven't needed to look at other models. I like the HF20 because the remote works on the viewer side instead of the front. This makes it easier to make function adjustments like focus and exposure and zooming on the fly quicker. Any camcorder with FULL MANUAL CONTROL will do. That's the reason I retain my good'ole Panasonic GS-400 for std. def work. For HD transfer I use Canon HF-S 20,great image quality with some manual control (although not as extensive as panny's). The major letdown is that it will revert to automatic settings every power off>on - necessary to readjust everything at every power cycle,not so convenient (considering to replace it with something more decent). I now have all the equipment (both the projector lens and the macro lens) for experimenting in both scenarios. Are there specific Canon settings that you have found helpful (e.g. AF Mode, x.v.Color on or off, shutter speed)? Also, have you tried both component as well as HDMI connections to the Blackmagic card? Is there a noticeable difference? Hi Tom...Looks like you are set to do some experimenting. As far as HDMI vs Component ... I don't have an opinion just yet. I just setup a new computer and just started using the HDMI cable. My previous capture station wouldn't recognize the HDMI cable. I have noticed more grain in the HDMI captures...I plan on going back to do a comparison with the component cables to see if it makes a difference. I'd be interested in your feedback. 1. Focus: Start by using AF to get an initial focus...then change to MF. This is to stabilize the focus and keep it steady. 3. Digital Zoom: None.../or 60x if you can't get the image to fill the sensor. This may depend on whether you are using the 16mm lens vs. the Macro lens. 8. White Balance: Automatic usually... but can be done Manually ... depending on condition of film. I had trouble with the Raynox macro lens - couldn't focus. I'll try your tip on digital zoom to see if that helps. My initial tests using the 16mm projector lens looked GREAT (much better than the old setup, especially better lighting. As for grain in films, I have been using the Neat Video plugin for years now and once you get experienced with it there are amazing results on old 8mm and 16mm films. When using the Raynox lens the focal length is very short. Try placing the lens as close to the edge of the projector as you can.I use a macro focusing rail on my mini tripod to help make small focusing adjustments much easier. I too use Neat Video for grain filtering and sharpening along with VideoFred's Avisynth scripts and Premiere Pro. I'm very happy with the results. You mentioned that you discarded using the XHA1 camcorder for this. I have a second Workprinter-HD that I may convert. What were the specific reasons for not using the XHA1? I've done a little research and it seems obtaining a super macro lens is a bit dicey. I love the manual controls on the XHA1 but am interested in your experience. For my setup the XHA1 was just too big and heavy for my mini tripod. My work area is very compact so the smaller camcorder is more practical. 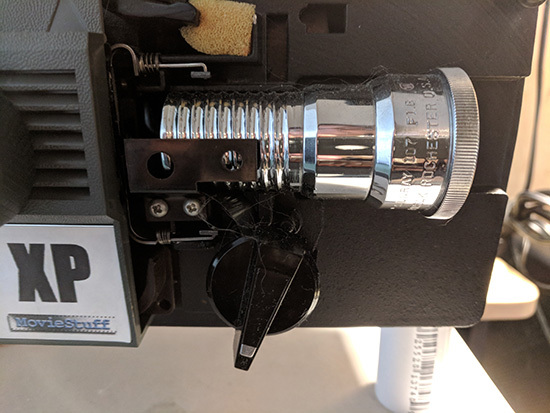 I was able to get the Raynox lens to fit on my XHA1 with adapter rings...but I couldn't get the lens close enough without hitting the supply reel. I raised the supply reel, but I still couldn't get the image big enough to focus properly with the Raynox lens and the 16mm was just to small. Maybe you can get it to work. I agree the XHA1 if a very nice camera...but the smaller models have all the manual controls you will need and take up a smaller footprint. Thanks for all your tips and help. I love the results, especially the lighting. I'm able to capture footage that I wasn't able to with the old setup. 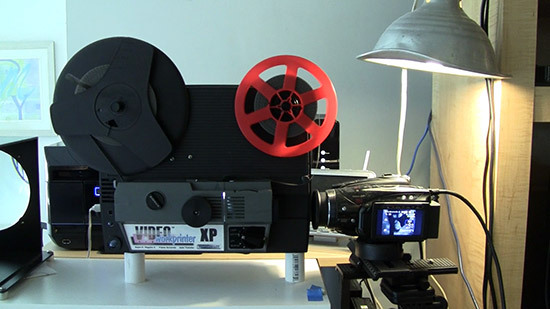 I'm curious, though: do you know of any other software that works with the workprinter other than Cinecap Velocity HD? I understand it is no longer offered and would like to have a backup source if I have software issues. Tom, I don't know of another software to work with these old systems. I'm only using the original Cinecap software that wasn't designed for HD...but it does work to capture HD. The framerate conversion feature doesn't work, but this is easily accomplished in VirtualDub. My first capture setup was on a Windows Vista PC. Now I'm using the same Cinecap software on a Windows 10 PC. It actually runs better on the newer OS. Your Cinecap Velocity HD software is more advanced and designed to handle HD captures. I just recommend keeping multiple backup copies of the installation software in case you need to re-install. I've seen where you can still buy the the original version of Cinecap software -that I have, but don't know if this site still works. Hate to be a pain, but are there other lens you have tried with the Workprinter. The 2" Sunray 107 F 1.6 lens fits perfectly (and you can actually fit the cover over it. 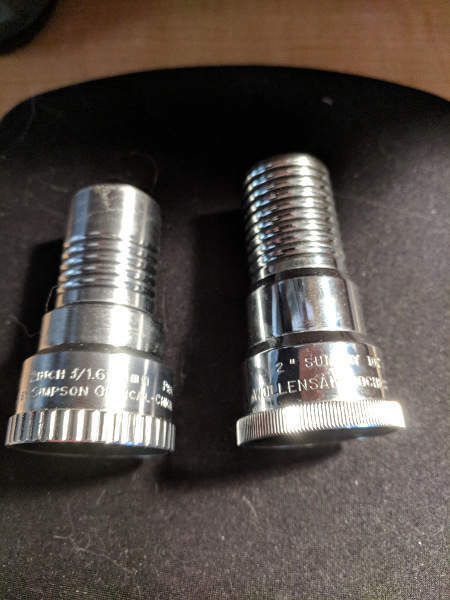 I'm having trouble finding other lenses with the 3/4" diameter that fit. Trying to see if different lenses provide better quality. I'm ending up with a collection of lenses that don't fit. Since my 16mm lens is in excellent condition I have found the quality to be very high for my captures. 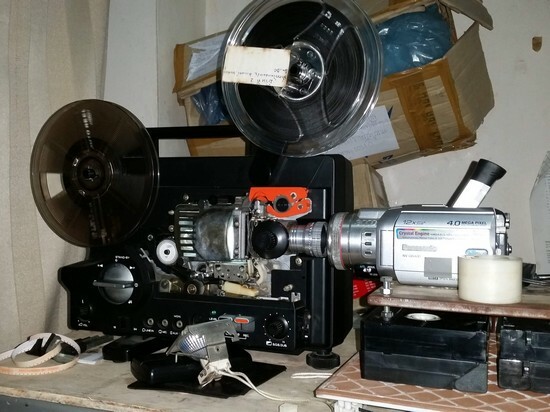 You will not find a small barrel 16mm lens in any of the newer model projectors. Here are the two lenses I have. I find the Sunray lens to be slightly better...but they are pretty close in clarity. The Sunray on the right and the Keystone Brand on the left. Both have the same specs.